Thermage® technology enables dermatologists to tighten sagging skin, eliminate wrinkles and renew body and facial contours without relying on surgical techniques. Providing superior results with little to no downtime for patients, Thermage relies on the simplicity of radio frequency energy to superheat collagen within the skin’s deeper layers. Stimulating collagen production in this manner leads to enhanced toning, better definition of the neck and jawline and visible smoothing of fine lines, wrinkles and folds associated with excessive exposure to sunlight and aging. Thermage is not laser surgery. Instead, Mayoral Dermatology in Coral Gables, use the ThermaTip™ device to deliver managed amounts of radio frequency energy into the underlying skin structures, resulting in an immediate tightening of the skin. Most patients begin witnessing amazing results within two to six months of experiencing non-invasive Thermage® treatment as skin is transformed into smoother, healthier, beautifully toned skin. What is Thermage Radio Frequency Energy? The kind of RF energy used in cosmetic treatments is technically called “non-ablative” energy. Consisting of short, strong bursts of energy that penetrate the skin, RF energy safely heats tissue for the purpose of inducing collagen production. Aesthetic Thermage® treatments are further enhanced with the cooling effects of CPT, or Comfort Pulse Technology, that protects the surface of the skin while delivering superior patient comfort. Even without CPT, patients would feel minimal discomfort because the radio frequency energy currents used during a Thermage® session changes direction so rapidly that it cannot depolarize nerve membranes. By initiating collagen remodeling, Thermage® essentially forces the skin’s deeper layers to repair the “damage” these layers experience when heated by radio frequency energy. Without collagen, our skin would have no structure or elasticity. Hanging from our skeleton like an empty sack, skin without collagen would quickly develop serious medical issues such as cracking, splitting and extreme folding. Collagen production begins decreasing in our 30s, which is why most of us start noticing the appearance of wrinkles, crow’s feet, “bunny” lines and lip lines during that time. The importance of collagen is evident in the fact that it represents nearly 1/3 of the protein in our bodies, making it the most abundant element comprising the body other than water. Collagen is also what makes it possible for the skin to stretch at all joint and muscle areas. Without it, you would experience pain and severely restricted mobility when attempting to walk or sit. Thermage® treatments induce several stages of collagen remodeling that begins with the first phase involving injured cells releasing inflammatory substances into the extracellular environment. This promotes the healing process (stage two) which stimulates collagen production or collagen “remodeling”. New collagen fibers create something similar to a band-aid that provides enhanced elasticity and strength to old fibers weakened by Thermage treatments. The last stage is the actual remodeling stage in which new, fresh collagen fibers realign themselves to take the place of damaged ones. Because RF technology expedites these healing phases, most patients feel and see results within two days of having a treatment session. Mayoral Dermatology provides Thermage® treatments to correct minor abdominal issues. Without the pain and downtime associated with cosmetic surgery, patients can have their stomach area contoured and tightened with RF technology applied by one of our professional providers. In addition, patients are amazed at how quickly they see results after only one session of Thermage NXT®. In most cases, results last as long as 18 months. Would you like to have a neck, jawline and chin that is no longer sagging or wrinkly and looks smoother, tighter and distinctly more contoured? Mayoral Dermatology also offers Thermage NXT® treatments to eliminate neck and face skin issues associated with aging and overexposure to UV radiation. By stimulating collagen production with RF energy, our providers can smooth away nasolabial folds, “marionette” lines and give you a naturally younger-looking skin for a youthful, refreshing appearance. By providing Thermage RF technology treatments to our patients, Mayoral Dermatology can give you visibly dramatic results that are less glaring and more subtle than cosmetic surgery. No one will realize that you have undergone Thermage® because the transformation from wrinkled, aged skin to smooth, glowing skin is unobtrusive and impressively natural-looking. As a patient at Mayoral Dermatology experiencing Thermage NXT® for the face, neck and abdomen, you will not suffer administration of general anesthesia or experience downtime associated with the major surgical incisions required for traditional face lifts or tummy tucks. These benefits also make Thermage® an ideal choice for those who have already had cosmetic surgery and want to maintain the results without facing the risks and recovery time of invasive procedures. Each client represents a unique opportunity to create a more youthful appearance. 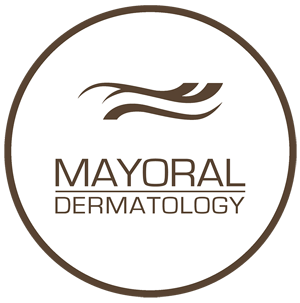 Mayoral Dermatology provides outstanding client support, ensuring quality results. Saturday: by appointment only for cosmetic procedures.